Pizza (pronounced peetza) is an open pie of Italian origin, which has a bread like base and is traditionally covered with toppings like seasoned tomato sauce, cheese, meat, spinach, mushrooms, onion and olives. Pizza is the most versatile Italian dish that is now "not Italian" at all. There are countless varieties of pizzas available in restaurants and in every individuals' house. The toppings and the base can be varied according to one's choice and preference and is considered an easy Friday meal by most families with children. Honestly, I had no intentions of posting a recipe for pizza; at least, not in the near future. But when my friend asked for suggestions on pizza toppings, I realized that each of us must be tired of our regular toppings at home. And some of us must be looking out for new varieties. So the post for pizzas are here to stay; to share ideas on what I use and also to get opinions from my readers as to what they use to prepare a gourmet pizza at home. Before I start on the recipe, a small note on the pizza base. 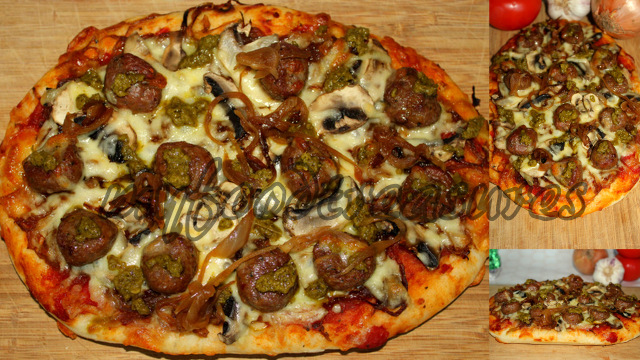 The recipe for pizza base I have here, is quick and easy and gets ready in 30 to 60 minutes. But if you are really pressed on time, you can always use the Indian Naan, Lebanese Pita Bread or Frozen Puff Pastry for a tasty pizza base (adjust cooking times and oven temperature accordingly). Unfortunately, I have not yet come by a good ready-made actual pizza base that can take over any of the other pizza bases that I use. But yes, the choice is personal and it is your preference. 1. Heat oil in a frying pan over low heat. Add onion and stir to coat. Add sugar and salt, mix well and cover and cook, stirring occasionally until onion is golden brown in colour. Then uncover, keep stirring and cook until caramelised. Season with pepper. Set aside to cool. This should make around 1/4 cup of caramelised onion. 2. Preheat fan-forced oven to 220°C. For thick crust pizza, roll out dough into 1 cm thickness. Make dimples on the pizza dough base with your finger tips all through the surface. Leave base to rise for 10 minutes before assembling with toppings. For thin crust pizza, roll our dough into 5 mm thickness. Assemble with toppings immediately. 3. In the meantime spread sliced mushrooms evenly on a flat plate. Sprinkle with water and salt and microwave on high for 1 minute. 4. Spread pizza sauce gently on the pizza base using the back of a spoon, evenly. Top evenly with 1/4 cup of caramelised onion. Then spread microwaved mushroom slices. Spread 1/4 cup of pizza cheese on top of mushrooms. Arrange uncooked meatballs over the cheese spread. (If you want to use cooked meatballs arrange them on top of mushroom layer and then top off with cheese. This will prevent meat from drying out in the oven). Finish off with 2 tbsp of remaining pizza cheese. Bake for 15 - 20 minutes (for thick crust pizza) or 10 - 15 minutes (for thin crust pizza), until the meatballs and base are cooked through and cheese has melted. (Baking time depends on your oven). Remove from oven and drizzle with basil pesto. I love pizza. Mine will be coming soon too. I can use these onions for mine. carm. onions wud be jsut great on pizzas..shud try it out..thanx for sharing dear.